Great Migrations Blu-ray Review In the end, Great Migrations is easily one of the best documentary series produced and if you are a Blu-ray owner, this is the definitive version to have. This amazing National Geographic special is currently being screened on Channel 9 and is also available on DVD and Blu-ray through Madman. 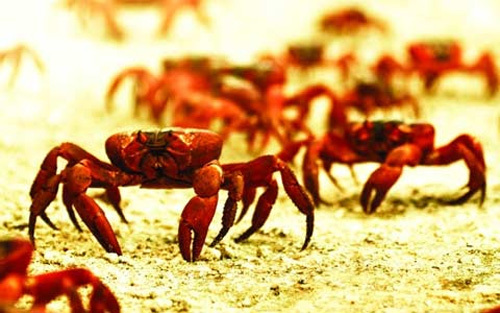 The documentary is reminiscent of the excellent BBC Earth documentaries as it showcases a plethora of amazing species. 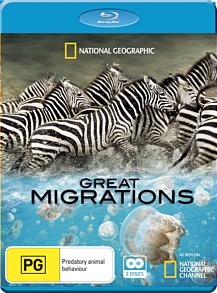 It should also be noted that this series took over three years to produce and it is littered with some of the most spectacular footage of animal migrations from around the world. Before I get to the content of this review, I need to speak about the video quality behind Great Migrations... wow... the video quality of this release looks amazing, thanks to its 1080i presentation that boasts some breathtaking scenes with ultra sharp images, vibrant colours and deep blacks. Some of the close-ups are to die for, especially the Monarch butterflies or the deadly crocodiles who attempt to hunt the animals who dare cross their river. At times, it's almost like these animals are about to jump out of your TV screen and even the close-ups of these animals is just gobsmacking as you see every individual hair or bumps on these creatures. For example, the walrus close-ups is like you can reach out and pull their whiskers and you see every imperfection on their skin. For a documentary on migration that hovers between life and death, Great Migrations is almost a living breathing entity and could be considered a heirloom to future generations. Coming on two Blu-ray discs, Great Migrations collects all four episodes from this series and includes an additional two bonus specials that are equally as good. The episodes included in this release are Born to Move, Need to Breed, Race to Survive & Feast or Famine which touches on a variety of elements of the lives of various species from around the world. The first episode Born to Move focuses on the aspects of birth, life and death. The highlight of this episode were the monarch butterflies as we are given an insight into their colourful and majestic yet short lives. From close-ups to long-shots that show thousands of these butterflies moving, it was truly a sensory overload and looked amazing on FULL HD. The episode also featured a very graphic scene that involved the wildebeests being attacked by cheetahs and crocodiles which was actually quite disturbing due to the high quality video footage. It almost brought a tear to my eye because of how emotional it was. Therefore parents should be advised that with younger children, they may need to monitor their viewing. Another interesting part of this episode were the ants from Costa Rico who demolish everything in their path and Alex Baldwin throws in a great Star Trek reference "resistance is futile!". I was also impressed to know that whales can live beyond 70 years and one ageing whale would have swum around the world more than 60 times in his life. Following on is Need to Breed that focuses on the procreation and parenting of animals. From birds to mammals and the some amazing rare footage of the white-eared knob antelope, it's another powerful and moving episode. Race to Survive focuses on the migration habits of the Zebra as they make their move from deserts to grasslands. Although there are other animals in this episode, the main focus is on the Zebra and just like episode one, there is another graphic scene involving crocodiles and Zebra. It's also quite baffling to the mind that with all the places to cross, these Zebras decide to cross where there is a huge population of crocodiles. Nonetheless, Race to Survive once again features some amazing footage of not only the animals but also that of planet earth. The final episode is Feast or Famine and focuses on the food sources for various species around the world and how their migration patterns are influenced by their hunt for nutrients. The highlight of this episode are the African Elephants in the Sahara desert and with so many other fertile areas near this region, it's quite amazing to watch their journey unfold as they search for food and a place for their young to grow. 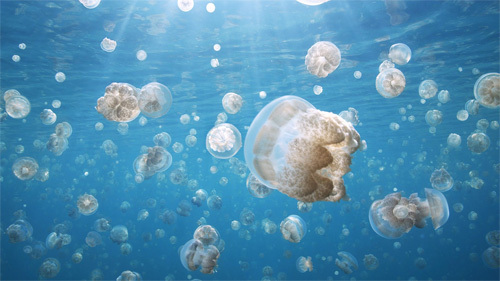 Apart from land dwelling creatures, Feast or Famine also showcases the underwater variety from sharks to jellyfish which are just as insightful. Given the diverse cast (e.g. 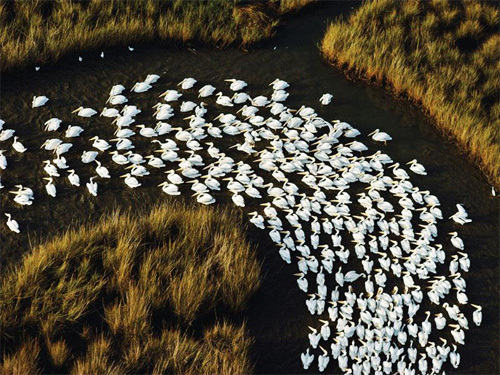 the animals) of Great Migrations, National Geographic have done a commendable job at not only making it a visual treat but ensuring that the information is accessible to all. It does help that Alex Baldwin is the voice behind this series who portrays a sense of wonder and majesty. My only one gripe about this series is that sometimes it uses footage seen in previous episodes but this is only now and then. It's the only issue I could find about this entire collection. The audio quality of Great Migrations supports a lossless surround track with a DTS-HS Master Audio 5.1 format. There's some great use of the channels in this documentary and everything sounds crystal clear. At times, there is so much happening at once that it's almost like you are in the jungle or in the Sahara desert. 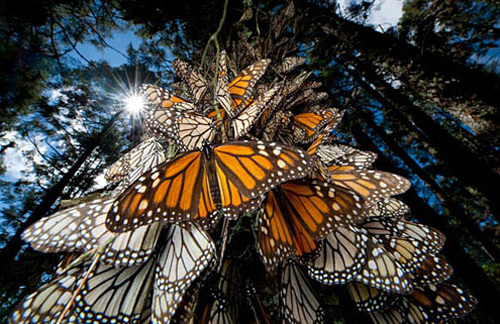 The most amazing aspect of the audio are the smaller creatures such as the Monarch butterflies as you actually hear the powerful flaps of their wings or the red bats from Australia. In terms of special features, Great Migrations comes with The Science of Migrations and Behind the Scenes of Great Migrations. The Science of Migrations goes into the process of how the scientists through research and technology followed these animals on this powerful journey. Behind the Scenes of 'Great Migrations' on the other hand focuses more on the filming of this documentary and how they achieved some of these amazing shots, especially the close-ups. Both are a must watch special feature. In the end, Great Migrations is easily one of the best documentary series produced and if you are a Blu-ray owner, this is the definitive version to have. It's produced on the same calibre as the BBC series Planet Earth and looks visually stunning thanks to its 1080i presentation. Sound is equally impressive as is the content of this documentary. Highly Recommended!